The new Bluetooth 4.0 Everest Elite 100s cost $200. For the money they’re pretty loaded. The top feature is adjustable noise cancellation, which is similar to the variable noise-cancellation used in Parrot’s excellent line of Zik headphones. “Active” noise cancelling headphones work by using tiny microphones to listen to the roar of the outside world, and then creating inverse sound waves to cancel it out. 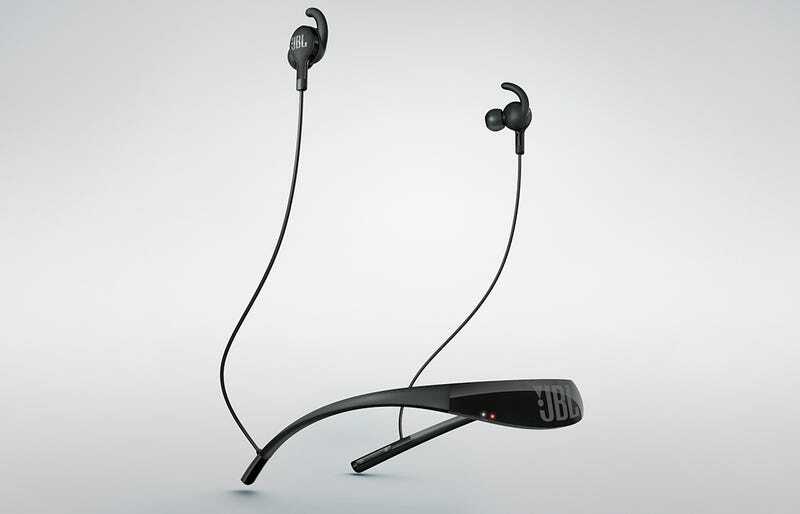 The NXTGen ANC tech, as JBL calls it, allows you to use a phone app to adjust just how much of the outside world you want to hear. You know, for a little situational awareness so you don’t get nailed by a bus while crossing the street. Yes, these are powered headphones, which is why you need that nerdy neckband attachment to hold the 6-hour battery pack, the Bluetooth radio, and an amplifier. Does it look geeky? It sure does. But these headphone are also very practical. If you’re feeling self-conscious, just turn that noise cancelling up to eleven.